Born out of Ontario's Celtic Heartland of Glengarry County, Ontario, a small Eastern Ontario community, rich in Scottish & Irish heritage. The Group formed in March of 2006 by Bradley & Michelle McMillan, Playing and writing Original music, as well as performing you’re traditional Irish & Scottish songs, they built a strong following placing emphasis on combining the sounds of traditional Celtic music and fusing it with rock, Country, Canadian east coast folk, and that Glengarry County Music Sound that has made the area so popular through the years. There original songs focus on there Celtic culture and that of living and growing up in Glengarry County. There love for Celtic music and Glengarry County, shine through every time the group takes to the stage. They have released 3 albums to date, in 2007 the band released a 5 song EP entitled, "The Dungeon Sessions; the E.P sold in excess of 500 copies in 1 month, and is currently sold out. 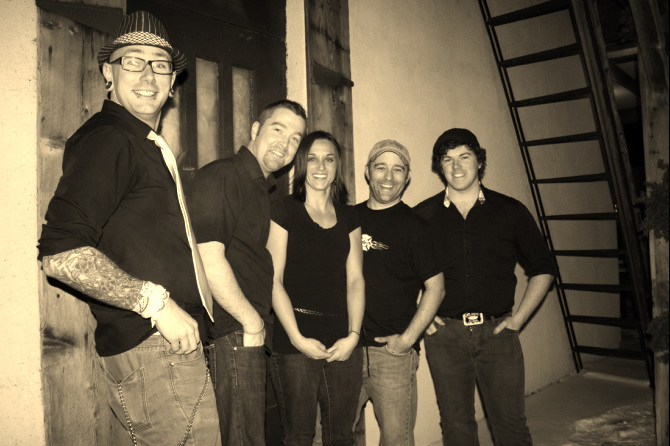 There debut full length release entitled,“Green Grass And Gravel Roads”, was released on June 6th, 2009 to a sold out crowd at the Glengarry Sports Palace, Where the band kindly Donated all proceeds from the night to the Children’s Hospital Of Eastern Ontario raising over $2800. The Album was recorded at JMAC Studios and mixed by Ewen Macintosh (The Pogues, The Mahones) at the Glengarry Music Mill. To date the album has sold over 1800 copies. It has been shipped all over North America & Europe. It features 13 songs, all of which were written and performed by the band. Irish rock webzine ShiteNOnions, classified the album as honorable mention for 2009 Celtic Rock Album of the Year. In 2011 the band entered the Glengarry Music Mill, with producer and engineer Ewen McIntosh (The Mahones, The Pogues) to record, “Tales From The Glen”, the album featured 10 songs, 3 of which were written by the band. The album was mastered by Ryan Morey at Ryebred Mastering (Arcade Fire, Bedouin Soundclash, Saint Alvia Cartel) . The Band is in Early Preparation for a brand new album in 2013 entitled "Pubs, Pints and Pipes". CKCU, as well as several internet podcasts and internet radio Stations all over the world. They have had the opportunity to perform through out North America at several high profile festivals such as The Glengarry Highland Games, The P.E.I International Shellfish Festival, Cornwall Kinsman’s Lift-Off Festival, The Russell Celtic Festival, The Canadian Solo Pipe-bag Championships, The Vankleek Hill Fair, The Williamstown Fair, Canada’s Irish Festival in 2009, 2010, 2011 & 2012 and Toured Canada's Maritime Provinces Four times through. They have had the opportunity of sharing the stage with some of North Americas great musical acts such as Amanda Marshall, Finger 11, The Makem and Spain Brothers, Signal Hill, The 2 Paddy’s, The Mahones, The Town Pants, The Prodigals, Shanneyganock, Kelly Trottier, Bob and Ducky, Fridge Full Of Empties, Ambush, Rubicon (Ireland), and more. The groups live performance is one that must not be missed; they’ll have you up and out of your chair, clapping your hands in no time. The band has built a strong reputation on getting the party started early and keeping the people on there feet to the wee hours of the morning. "Green Grass And Gravel Roads"